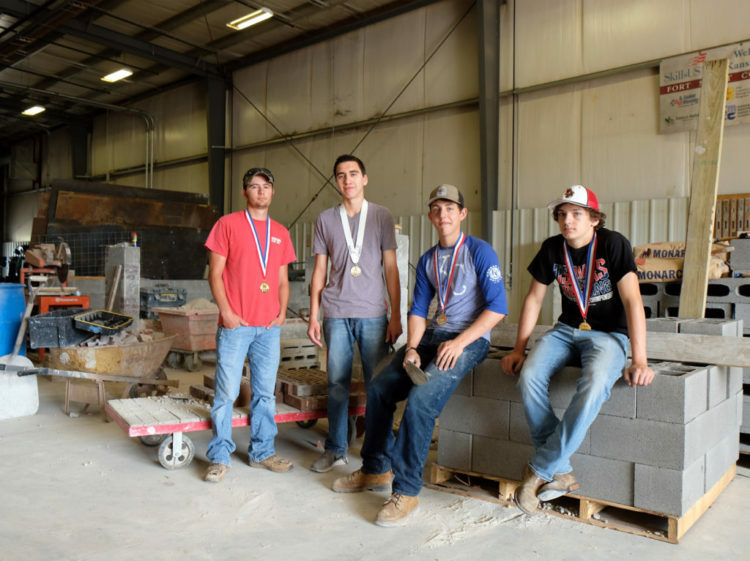 Fort Scott Community College students Dylan Giager, from left, Alex Garcia and Pittsburg High School students Coltin Oehme and Wil Jameson qualified for the SkillsUSA National competition after sweeping the SkillsUSA state competition in masonry and carpentry. Fort Scott, Ks.—Fort Scott Community College Construction Trades and Masonry students head out to Louisville, Ky. to compete in the 54th annual SkillsUSA National competition held on June 25th-29th. Students who placed first at the state level competition earned the chance to take on nationals. 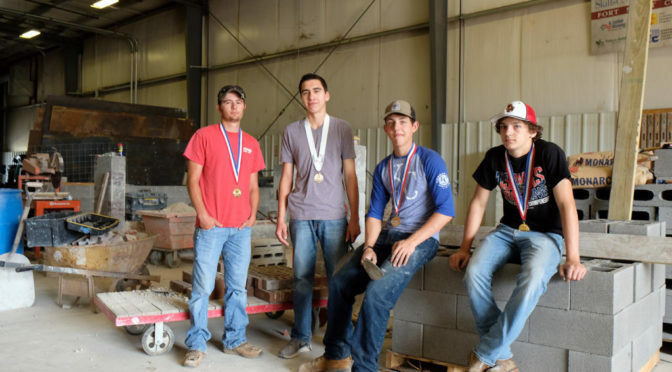 FSCC took 13 carpentry students, 3 HVAC students, and 3 masonry students to state and 4 students came out on top; Alex Garcia and Coltin Oehme for masonry, Dylan Giager and Wil Jameson for carpentry. FSCC sophomore Siarra Clark, who came in second at state, but only by a couple points, says “I was raised around concrete and construction so the program at FSCC was fitting. The competition was a great experience and I hope to compete in something like this in the future.” Siarra took 1st in the hands-on portion of the state competition and 2nd in the written portion, making it 2nd overall. FSCC carpentry students Dylan Giager (FSCC) and Wil Jameson (PHS) will compete on the carpentry side of SkillsUSA. This is FSCC carpentry’s 7th year to nationals under the supervision of instructor Kim Coates. “You never know who is going to bring who,” says Coates, “Wil Jameson is the first high school sophomore to win gold and go to nationals…I was surprised and very excited.” Brady Newman, FSCC student barely came in 2nd behind Dylan Giager by only 2%, winning him a silver medal. Right behind him was Thomas Mayfield with a bronze medal.